Huge piles of chips are one of the first things that come to mind when someone mentions poker, but most people probably don’t stop to think why chips exist in the first place. Isn’t it a hassle converting all that cash into these weird play money discs, only to exchange them for money again later? But there’s an excellent reason for that—chips are easier to count than cash! Casino cash offices have millions of dollars of specialized equipment for counting cash, but the only equipment for counting chips are plastic racks, a smooth surface, and a clerk’s bare hands. Anyone can learn how to count poker chips like a pro! The first step to counting chips is to get some chips that are easily countable. Not all chips are made alike! Casinos use chips that are flat, smooth, and made of clay that gives them some friction and “stickiness” to make them easily stackable. They have labels with custom-printed artwork to distinguish the chip from those from other casinos, and images which appear under a blacklight to deter counterfeiters. Such chips are expensive, costing more than $1 for a single chip! The durability of these chips makes them cost-effective for the casinos, but hobbyists simply can’t afford to spend that much on chips. 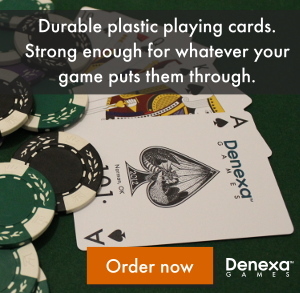 Instead of clay chips, home poker enthusiasts must rely on cheaper plastic-based chips. The very cheapest of these are thin and lightweight plastic chips with interlocking ridges to keep stacks of chips from toppling over. Such chips are to be avoided; the interlocking feature of the chips makes them very difficult to count! Instead, you want something more like a casino chip, with smooth surfaces. Some texture is good, to help add clay-like friction that that is missing in a plastic chip. Many retailers offer a composite chip, which is composed of a metal slug (to add weight) with plastic molded around it. These chips often include artwork of dice engraved on their faces. 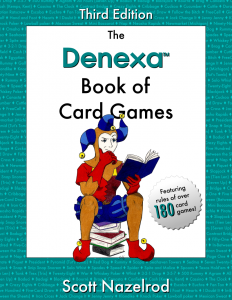 These chips are reasonably-priced and readily available, and will do just fine for most players. For players wanting a more casino-like feel, generic clay chips are available on the Internet, such as Da Vinci chips (pictured), which are sold in batches of fifty for $20. Now that you have your chips, you need to assign values to them. It’s important to use values which are conveniently spaced apart, so that chips can be colored up or colored down (changed between denominations) easily. You don’t want one chip to be worth twenty of the next color down! You also want your players to understand the easily understand value of the chips, and if your players have played in a casino (or other games) before, they will expect your chip colors to match what they’ve seen. Beyond the $500 level, chip colors are not standard from casino to casino. Of course, if you play penny-ante poker, it hardly makes sense to have $100 chips; instead, you can divide this chart by 100, and have your white chips valued as 1¢. Note that each chip is worth either four or five of the next chip below it. This makes counting the chips easier! First, separate your chips by color, and arrange each color into a stack on a smooth, flat surface. A felt table or chip count board works best, but any flat surface should do (avoid uneven surfaces like a bed or carpet). Select a color to count (e.g. red chips). Carefully count chips from the bottom of the stack, forming a smaller stack. Stop when you get to the number of chips which would equal the next higher chip (e.g. five red $5 chips equals one green $25 chip). Place the main stack next to the small stack. Now, bracing the big stack with your thumb, slide your index finger across the short stack, then use it to tilt the big stack away from the small stack, as shown in the photo. This process, known as sizing into the big stack, should produce another small stack equal to the height of the first one. 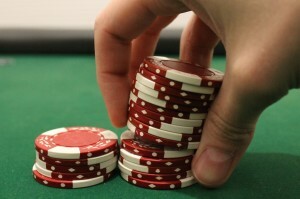 Keep sizing into the stack repeatedly until you don’t have enough chips to make a full stack. Place these chips on the table individually next to the stacks. Run the back of your index finger across the top of the chip stacks to verify that they are all the same height. If any stack has too many chips, you’ll knock it off, or if it’s missing one, you’ll feel your finger dip. Splash the last chip stack out on the table. This is toppling the stack so that it’s fanned out on the table, as shown in the photo at the top of this post. This allows you to visually verify the number of chips each stack contains. Perform this procedure for each color of chip, starting a new row for each color. It’s typical to have the highest-value chips closest toward you, with the value of each row further away from you diminishing (a procedure which is done in casinos to keep unscrupulous patrons from snagging the high-dollar chips after they have been counted, but is useful at home to keep things orderly). Now, counting the chips is simple multiplication. If you have five stacks of five red $5 chips each, then each stack is $25, so you have $125 worth of red chips. If you have multiple denominations of chips to count, start with the largest denomination and work your way down to the smallest. It may help to use a calculator to count very large amounts of chips of separate denominations (add each denomination’s count to a running total in your calculator). 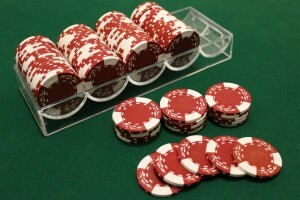 Before passing any quantity of chips to a player, it’s a good idea to break down the stacks of chips, as shown above, to allow them to visually verify that the correct amount of chips is present. You should do this when presenting a player with a buy-in, making change, splitting pots, etc. It’s typical to make mistakes handling the chips at first, but repetition will help you become more familiar with the feel of your chips and the mechanics of sizing into stacks and counting. Keep practicing! Legendary! This is just awesome! Not simply top quality, but likewise important details. And that is uncommon ahead by nowadays! I need to claim that I am actually pleased as well as will surely come back once more if you maintain the top quality and worth of the material at this degree, or perhaps acquire it on the following degree. Regards, from the bottom of my heart, thank you for your time! God bless! These tips are really helpful for everyone to count the chips in the right way. Thanks for sharing the poker chips counting tips with us..